cover by Rick Veitch & Cayetano Garza, Jr.
Writer/artist Rick Veitch's career bridges the underground comix of the 1970s, mainstream DC and Vertigo Comics, and the self-publishing revolution of the 1980s and 1990s. In that extraordinary body of work, Brat Pack® remains a landmark, and Teen Angels & New Mutants is the first book-length, in-depth study of a creator and graphic novel worthy of the autopsy. En route, Teen Angels offers a crash-course on teen pop culture and superhero sidekick history, fresh analysis of Dr. Fredric Wertham's seminal books, ponders real-world "new mutants" like Michael Jackson, The Olsen Twins, and Justin Bieber, and charts the 1980s comicbook explosion and 1990s implosion--and more. 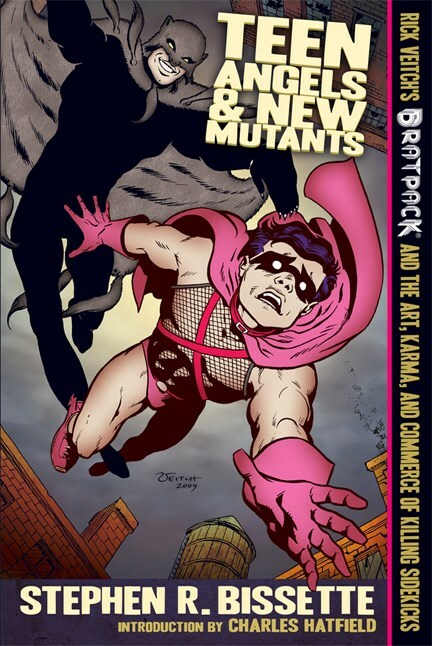 "Brat Pack® has been criminally under-appreciated for far too long.… Rick Veitch's groundbreaking works on the dissection of the superhero myth (The One, Brat Pack®, Maximortal) were released at the epicenter of teen angst, and his work was gritty in a style that seems to have been completely co-opted by the newest wave of comics journal darlings... With or without a cape or mask, his borderline underground style has been copied ad infinitum without so much as a thank you. And that doesn't even begin to address the many mainstream superhero works derived from his incendiary ideas." -- Matt Kennedy, Curator, La Luz de Jesus Gallery; blog columnist, Exploiting the Media at Forces of Geek. "Teen Angels and New Mutants is a headlong, vaulting, risky work of cultural criticism that just happens to be a companion to an already risky comic. Bissette, with the right mix of outrage and suspicion of outrage, exposes how we fetishize childhood in popular culture yet at the same time exploit and abuse real children. The result: chilling, fascinating, and unforgettable." Brat Pack® is a registered trademark of Rick Veitch, and is used with permission. There aren’t many books which name check Batman, David Cassidy, Naomi Wolf, Arthur Rimbaud, Lindsay Lohan, and Justin Bieber. But then, there aren’t many books like Teen Angels & New Mutants. I'm not easily impressed, and while I'm possibly prone to fanboy zeal when presented with a rare opportunity to laud a work I feel is worthy, I don't know that it is possible to overrate this book. It is a work unique to the subject matter, and I speak not only of the genre of comic book analysis, but of pop-culture autopsy. Bissette has pioneered a new field of criticism nearly thirty years after he helped reinvent the horror comic. With this project, as author, he has attained equal footing with former collaborator Alan Moore, and if they don't give him an Eisner Award for this, they might as well quit handing them out all together. Teen Angels and New Mutants… uses Brat Pack as the central reference point for a complete pop cultural autopsy of teenagers throughout the history of media. It’s the greatest reference book you never knew you needed. If you have even a passing interest in comic books or pop culture, you can do a lot worse than read Bissette’s book, and you should run right out and buy the collected Brat Pack. There's comics history, pop cultural insight, film analysis, and a very intelligent and informed look at the entertainment business at large (and our inevitable symbiotic relationship with it). A good read, scholarly (but not academic), entertaining, and vastly informative. Thoroughly illustrated. I honestly couldn't put it down. Enthusiastically recommended.